Our dentists in Yonkers are board certified, award winning dentistry experts and contributor to a prominent media outlets. Top rated Yonkers dentists provide a full range of family dental and cosmetic procedures to treat conditions that affect your gum and facial bones. Our state of the art cosmetic dental clinic and pediatric dental center in Yonkers equipped with the most advanced equipment available in USA including latest, top performance lasers & high precision microscopes. We use only the best quality medical grade titanium or titanium alloy for dental implants. Dentist in the Bronx always appreciates feedback from our valued patients. We encourage you to leave your feedback on Google, Yelp, Facebook or simply use the form below to leave your honest review. We value your feedback. Please read what others are saying about our Bronx dentistry center. The overall feel was this is a very well run office, and Dr. F is a very professional, very personable dentist. My appointment was for 10, it’s now after 1 and I haven’t started my cleaning. That’s all I want..
Dr. Farokhzadeh and the entire staff are all excellent and while it can be a long wait time, it’s well worth. By far the best dentist or Doctor I’ve ever been seen by. Amazing services! Beautiful staff! Very clean environment! I was very happy with my services! Dr. Lopez and Byron are the best. They gave me my smile back and changed my life. I highly recommend . Dr Farzin is the best hands down!! I did my invisalign with him and his work is efficient and professional. He takes his time making sure everything comes out perfect. Going into the process I was a little nervous about the process and the outcome but I am so glad I trusted him and I love my new smile. I highly recommend you go see Dr Farzin. Very nice staff, very professional Dr.frazin is an experience doctor working with Invisalign. He’s there’s to make your smile beautiful and to make you feel happy. From the receptionists to the surgeons and especially Dr. Lopez is the best a true artist. They were very compassionate and walked me thru everything with patience. The staff is very nice! Good doctors and very nice. So I am having second thoughts about enrolling myself and my family here. I came here with my friend and her daughter visiting the orthodontics downstairs and as of 02/26/19, there was a huge issue upstairs where I believe a gentleman in a grey suit and a short female doctor argue at a very high-tone. I recently moved from Chicago and one of my family members go here and was referred to Dr. Habib since hes the owner and doctor of the practice. I just found the whole situation was very unprofessional. The worst dental office to go to. If you try to make an appointment expect it to be in 3 to 4 months depending on your insurance. They don’t comfim your appointment. So if you miss your appointment that’s another long wait to get service. The wait is horribly long. If you have a 10am appointment expect to be there all day. This is one of the worst dental offices I have ever went to. Good dental work but everything else about it is horrible. I remember this office and it’s old staff. All of these new workers here don’t care about the patients. Just a pay check. Great experience. Was guided throughout the whole process. Definitely recommend. Came here with my girlfriend for her appointment. Had to wait over 2 hours to get out of there. The appointment was for 12 for a cleaning and to get some invisalign trays. My guess is they double book appointments. Come here if you enjoy waiting in a packed lobby for hours. LONG WAIT!! I waited 2-3hours for an Emergency Appointment. Very Small building with lots of patients. To solve this problem they shouldn't book more people than they really need. Waiting people's valuable time!! Between the dentist and the staff nobody has anything together. It’s discombobulated , people are suppose to try to help if it’s an emergency or you’re in pain and they could care less . Dr. Farzin did an amazing job with my Invisalign. I’m so happy with my result. The best of the best. Did my Invisalign treatment for ~a year. Wonderful experience, very happy with the results. He was nice and professional. Not very charismatic. He answered all my questions and didn’t get annoyed when I was confused and explained everything over to me. He explained my care plan to me and what to expect. I came for a cleaning and I ended up getting fillings replaced with white ones by another dentist, she was very nice as well. I’m going back next week to get a cleaning. Where to start, the front staff is friendly, professional and well informed. I have run the gammet having had everything from the best cleanings to life changing dental implants and cosmetic dentistry. Dr. Habit is awesome at all aspects of cosmetic and family dentistry. He genuinely cares about his patients. He has moved heaven and earth to please me. Finally I found a dental office that makes feel at home. My 13 year old twins have no fear of going to the dentist due to the impeccable care they have experienced at Dr. Habib’s hand. He took the time to explain what to expect. And I kid you not he pulled four baby teeth and my son was a trooper. This is because Dr. Habib’s bedside manner. Most of all I am so greatful for the beautiful smile I have been granted. Since I battled cancer I have lost many teeth. It is life changing when you are embarrassed to laugh, smile or even speak due to tooth decay. Today I smile. I laugh. And speak my mind proudly. Gone are the days of sensoring myself. THANKS DR.HABIB!!!!! The dentists and technicians are great for Invisalign treatment. The only problem with this office is time management. They usually over book, if the clerical staff actually booked your appointment correctly, or at all. Just be prepared to be seen an hour after your appointment time. Eh tenido una experiencia fatal la Dr.Natalie F.es lo peor que puede ser como Doctor ,Ni mira el paciente ,Primero mira el Seguro que tienes y después te trata con prepotencia y Soberbia antes de tratarte lo que le importa es cuanto puedas pagar por lo que ella todavía no ha tratado ,es una Arrogante Racista, Racista. I have to admit, visiting the dentist is not something I look forward to, but I felt at ease as soon as I was greeted by the staff. It was my first visit so I showed up earlier because I knew that I had to fill out some forms, but I was a little surprised as to how quickly I was seen. Josiah was great. The X-ray were done quickly and painless. Margie was very pleasant and explained what I needed for my first visit. The cleanup was painless. Dr. Farzin, was very informative and explained in details the work I will need done in the next couple of visits. Alexandra, Yarima and Gladys, were very friendly and explained my co-pays and follow-up appointments. I’m already looking forward to my next visit. Josiah was amazing. X-ray were quick and painless. Great customer service! Everyone was very professional and courteous. I will definitely recommend this office to my friends and family. The wait was minimal and once I was in the dentist's chair the service was fast and of high quality. I left feeling secure that they will provide with the continued service I require. Staff is great ! Very personable, friendly and professional. Fast and to the point . Great and friendly staff !!!! I was called on time and dentist answered all my questions with satisfaction. I wish I had the Option of not giving any starts at all , I schedule an appointment for 4 members of my family today over a month ago at 930am just to find out the office was close!! No one was there and no one called to cancel the appointments! !extremely upset and my time is just as valuable as theirs. I DO NOT RECOMMEND THIS PLACE AT ALL. Very unprofessional. The best dental experience my family ever had,my kids loved this place.Thanks to Kenia and Cintia your team is great !!!!!!! First time at this dental office and I must say everyone here was cordial and pleasant... Dr.Nieman was very informative and detailed with what I needed... He made me feel very comfortable and welcomed... Took his time which I appreciated... Glad I took the chance with them..... I scored!! Don't come here unless you can waste an entire morning (with or without an appointment). Staff is friendly, facility is clean, BUT the wait is RIDICULOUS. I had a chipped tooth, called ahead to ask if I needed to schedule an appointment and they said it wasn't necessary. Waited 3hrs to be seen.. I am terrified of the dentist and Dr.Jilbert Neman did my two white fillings and i didn’t feel a thing. He went very slow and explained everything. No pain at all during this experience. Great dentist!!! Farzin referred me to another dentist in the office for extraction. This young gentleman seemed inexperienced with procedures and this was by far the most painful, time consuming extraction / cleaning procedure done on me compared to the several others I have had in the past. I am writing a review in particular with the services provided by Dr. Habib. I have been attending this office for dental care ever since I was a child. I have tried a couple of other offices and alway come back to their care. Many people complain about the wait time and yes, I can partially agree the wait time can be quite extensive. Which is why I schedule my appointments on Saturdays when I have nothing else to do. People need to understand this is a doctors office. It is a very limited amount of doctors' office where one can arrive and be seen 10 min after arrival. They are extremely busy and lenient here. Back to Doctor Habib, I am currently getting dental implants and he has done an amazing job. The implants have not been a bother and Im excited the process is almost over. If you are considering getting dental implants you should definitely consider his services. The place was very nice and clean. The staff was very professional and friendly felt very comfortable. They willing to work with you at any means necessary when it comes to co-pays and Insurance and appointments. I would definitely recommend anyone to come here for their care. Quick and amazing service. As soon as you walk in they take you. Very clean and modern look. They help you out if you ever have a problem. Amazing staff! Best dental office I've been to. Office is always clean, rooms are always clean, kind dental assistants. I highly recommend Dr. Habib, very friendly, gentle, & knowledgeable. Very clean, staff is so nice. I had the pleasure of having a consultation with Dr Natalie, she is so awesome! Honest & already had insurance papers filled out I return Monday. The best Dental office I've been to. Dr Natalie's assistant Rachel is so sweet & helpful. I'm so happy I have the pleasure of working with them both Racheal you ROCK-Park ave smiles takes all insurance, MVP too. Friendly service and very professional. The African American lady Upstairs didnt even allow me to schedule an appointment instead she suggested I'd go to the hospital for a hole I had in my tooth and I have nerves exposed, never am I coming back and I rather go to bronxville. I' happy with my doctor Farzin, he was nice and Professional, i recommended him. Dr. Farzin is the best at the invisalign he is absolutely patience meticulous at his craft and a little humorous. The staff is responsive and clean. Not always organized but recovers quickly and effortlessly. I am recommending two of my colleagues to Park Ave Smile specifically to Dr. Farzin. Dr. Farzin and his staff is very professional. I love the work he has done with my teeth. Services of Excellence in All. Thanks for their services. This is one of the best places to get your teeth fixed I’ve been here for about a year and a half and I got everything done here with no problems at all excellent place for your teeth. Dr Farzin is the One to go to for Invisalign. I love him and Dr Habib as well. I have a great time at their office. Everything is clean with the most modern technology. The chair massages you while you get a 3D scan of your teeth. If you have seen that yet you gotta get it done. Hello, I am a patient at Park Avenue Smiles. I got my wisdom teeth removed recently. Best experience of my life. The staff was very kind to me and the oral surgeon Dr. Rothenberg did a great job. I felt no pain. His assistants Katie, and Marisol were awesome, they made me feel at home. I also had a great recovery. I love this place. I've been coming here since I was a little girl and never had a problem. The staff is amazing especially Rachel and Glades and the doctors work with you too. Place: Clean, modern, friendly, updated equipment, nice waiting area and bathroom Staff: friendly, knowledgeable, my dentist tried to sell me on the Invisalign tooth straightener and no other Dentist has ever mentioned I need straightening, but otherwise he was knowledgeable, efficient, nice and didn't push me to do anything I didn't want to. He gave me options and let me decide, encouraging the more expensive option, which I expected any dentist to do, so I can't knock him for that. Their office is located upstairs. Not sure if it's wheelchair accessible is my only concern for future patients. Front door is also about 6 stairs up into the building. Upstairs office girls were nice and knowledgeable. Unfortunately I've had to go back twice for a problem with a temporary and then a crown that was temporarily glued in and then both falling out days later. When trying to have each fixed immediately I was told I can come back the next week and they don't do emergencies on Saturdays, which is the main reason for the 3 stars. Since I began going to Park Ave smile I’ve had nothing but Good experiences. Everyone is friendly and it’s not loud in the waiting area. I recently chipped my tooth at work with a ladder. Neman & Katery fixed it right up the following day with no issues. They literally saved my smile haha! 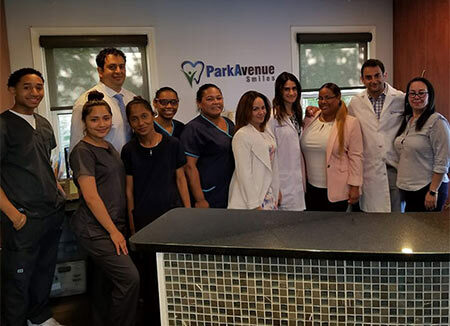 The service at Park Avenue Smiles is truly exceptional! Crystal the dental assistant is one of the best! Her care and attentiveness makes any dental experience an easy one. I recommend this welcoming and professional establishment to anyone seeking dental care. Job well done! The newly renovated offices have state-of-the-art equipment. The staff is kind & courteous and very professional. Highly recommend this dental office for all types of dentistry! Dr Farzin is great! He has an amazing ability at making you feel comfortable no matter what your smile looks like in the beginning! You will def love the end results! Def recommend! It was a great experience, staff are friendly, Dr Habib takes his time and makes sure your feeling OK and I loved the work he did. Really recommend this place. Dr.Habib and his assistant Ebony are amazing! The office is clean and the staff are caring. The wait time can be long but for what you get it is worth it. I am very happy with my smile. The staff is great and helpful. The dentist are very knowledgeable and have mastered their craft. I definitely recommend this dental office to anyone. Park avenue smile is wonderful dental office to go and get your dental checkup and work done so go and check them out. I've been a patient here for years great service. Dr. Farzin is the best! Highly recommend his services for Invisalign treatment. Been coming here for few years already and always been satisfied with the result! Love doctor habíb always doing a great job! I really like this Dentist. I feel I can ask him any question about his work and he is always willing to hear my concerns. Worst service ever! Very unprofessional and possibly fraudulent activity! Very unprofessional, very disappointed in head doctor. Obvious reason why periodontist was so unprofessional , because so was the head doctor when he threatened me by saying I wouldn’t like it if he were to get disrespectful, and said then we would have a problem . I was baffled and just disgusted. Front staff is very pleasing. How disappointing. Never attending again! Had to complain about a cleaning being done properly as well. Very lazy hygienist I saw at first. Second one did not reflect the boss. She was great. Place was very nice. It's a two part office. Bottom flr is orthodontist 2fl is dentist,nice waiting area,plenty of seats, 2tv's. I went up to check in. Receptionists were very nice and welcoming, filled out few forms for 1st time patient. I then waited maybe 5-8 mins before being called in for x-rays. X-ray tech, Kate, was very nice. Quick xrays, then went into a room, was seen by Dr. Farzin for consultation for wisdoms and just overall check. He was thorough explained everything in detail. I was there for a while but I'd rather a thorough Dr than a rushing one. An assistant came in to apply me for a care credit for payment plan, she was very nice and funny. Not once did i feel awkwardness, everyone was down to earth and welcoming to me. There confusion with which room I was going to afterwards, switched rooms a few times but nothing to give a bad review for. One of the assistants was a lil spacey. Dr had to keep on correcting what she was doing and she was a bit heavy handed was hurting me a bit while doing a 3D scan for Invisalign. Dr eventually took over and did it himself. Did a cleaning, my hygenisist was very nice, quick and thorough with the cleaning. Before she started she asked if I wanted numbing gel if I had sensitive teeth and I do so that was a big yes. But overall she was very gentle didn't feel any discomfort and teeth felt super clean after..cleaning in general prob took like 15 mins. Receptionists at check out was also very nice..she had a lot of pprwork to do for me but she was patient and also very down to earth and funny. Overall I liked the atmosphere of the office. Bathroom was clean and nice only thing was there was a window facing a house and there was no shade so that was a bit awkward. But overall this will be my new dentist and will recommend to family and friends. Very Professionally humble????... Though, I wish Dr would have shown me--walked me through explanation/educate me regarding X-Rays' results,& areas of concerns/problems if any, & all possible solutions & options/treatments if any at all...Other than tht, as of now, am very very happy I chose him as My Home Dentist???? I had a wonderful experience at Park avenue smiles. I was referred by my sister-in-law, her children are patients. Everyone was very friendly especially the girls at the front desk. The dentist was amazing. I felt absolutely no pain. Pleasant dentists and good facility. Wait time was 2 hours. and I was not alone waiting. Very good dental office/oral surgeon. Had 4 teeth extracted at once, painlessly and quickly when the process began. The only minor complaint I had was waiting in the office for 3 hours, which really shouldn't have happened but at the end of it all it was absolutely worth it. Staff was courteous and friendly. Will absolutely return to this office for future dental needs. Went in today for complete extractions of about 22 teeth for dentures. Was supposed to put under completely but instead they did enough to get me feeling dizzy then numbed me up with 8 viles of novocain. The Dr proceeded to start pulling and I had to be told several times to stop moving and have 2 assistants holding my head down. Yes people, I felt that crap the whole way through and not to mention left 5 teeth in so I got to go back in about 2 weeks. They started the work and if it wasn't for me wanting my smile back I'd go somewhere else. Very unprofessional in the extraction department. Park Ave smiles has a great staff but some areas that need some work. Do you have any questions about the best rated family and cosmetic dentists in Yonkers? For more information or to schedule an appointment with the best dentists in Yonkers of Park Avenue Smiles, please contact our Yonkers dental clinic for consultation with the dental specialist.